Vincent van Gogh, Isaac Newton, Wolfgang Amadeus Mozart, Ludwig van Beethoven, Edgar Allan Poe, Franz Kafka, Robert Schumann, Michelangelo, Virginia Wolf, Richard Strauss, Leo Tolstoy, John Keats, John Nash, and Ernest Hemingway, just to name a few. All of these great artists and thinkers suffered from some form of affective disorder (usually thought to be bipolar), alcoholism, psychosis, or were just plain weird (eccentric is probably a kinder word). If we added in more recent creatives with mental illness, such as Kurt Cobain (deceased), Elliott Smith (deceased), Stephen Fry, Jim Morrison (deceased), Allen Ginsberg, Janis Joplin (deceased), Kristin Hersh, Syd Barrett (deceased), Brain Wilson, Ray Davies, Jim Carrey, Ian Curtis (deceased), Sylvia Plath (deceased), and the lest could go on and on. Those listed as deceased died from causes related to their mental illness, directly or indirectly. Kristin Hersh (of Throwing Muses fame, as well as her amazing solo work) is a popular example of a gifted, perhaps "genius," musician whose mental illness shaped her work. Here are the lyrics to a song she wrote 10 years before recording it because she was unable to play it "without throwing up." Notice there are no stanza breaks, bridges, or chorus - this is probably what it feels like to be manic - and it almost feels like she sings it in one breath. It's not surprising then that 1984 was the year she was first diagnosed with schizophrenia (later changed to bipolar). Hersh had this to say about her mental illness (she has talked about hearing voices and described music as something she has "almost no control over, like well-rehearsed Tourette's"), from an interview in The Guardian. "I feel like music is real and bipolar disorder is not any longer," she says. "I hated the connection between mental illness and art. I couldn't stand that you had to be sick in order to create beauty, or confused to create truth. It made no sense. It was a huge relief to be essentially cured." We accept without questioning that mental illness and creativity are intimately linked, and there is some genetic evidence that there is a real connection (see here [bipolar]). Other researchers have found slightly higher rates of some neuroses (here [particularly in writers]), although that connection is tenuous. Perhaps at the most extreme end of the spectrum, in those we might consider true geniuses, there is a greater tendency toward psychological challenges. But in general there is very little real correlation, let alone causation, between creativity and insanity. In the article below, Arne Dietrich dispels that "mythconception." 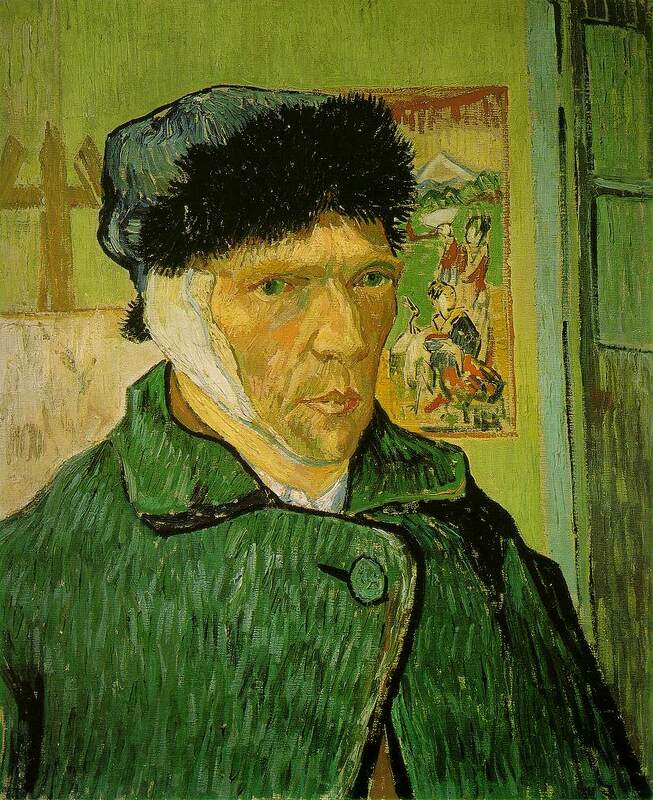 Take troubled Vincent van Gogh, famed 19th century painter who suffered from bipolar disorder, cut off part of his left ear, and eventually committed suicide. Or Isaac Newton, eccentric 17th century physicist, general headcase, and judging from his leviathan superego, a candidate for making the diagnostic criteria of at least half a dozen psychological disorders. No sooner do we contemplate this aberrant pair, a whole army of mad geniuses springs to mind led by such illustrious figures as autistic Wolfgang Amadeus, depressed Ludwig van, or tortured Edgar Allan. Like Franz Kafka, Robert Schumann, Michelangelo, Virginia Wolf, Richard Strauss, John Nash, or Ernest Hemingway, they were all, at some point in their lives, anguished, tormented, alcoholic, angst-ridden, manic, outright psychotic, or just plain weird. Add the mind-boggling savant syndrome, throw in a quote from a venerable ancient Greek for good measure—say, Aristotle: “No great mind has ever existed without a touch of madness”—and we have the making of mythconception (for more details, see Rothenberg, 1990; Schlesinger, 2009, 2012; Simonton, in press). Writers must by now have spilled gallons of ink over the purported link between creativity and madness filling shelves of books and articles (e.g., Post, 1994; Kaufman, 2005; Koh, 2006). Such tales from the insanity zone are nuggets of pure gold for the true believer in the unlock-your-infinite-creative-potential movement. What if we could just open “the doors of perception?” What would we have lost had Prozac turned Nietzsche into a regular bloke? Sadly, there is no sign that this kettle is going off the boil anytime soon. Hollywood can't get enough of it. Nor does the TED Conference, the new home of international meme laundering. The narrative of the troubled genius just strikes all the right chords for coverage in the tweet-sized attention span of modern news reporting. Not even the BBC can resist, having featured a headline last year reading: “Creativity ‘closely entwined with mental illness”’ (Kyaga et al., 2011; Roberts, 2012). Such frenzied enthusiasm and a few flag-waving generalization might be forgiven among those untouched by the purifying powers of statistical reasoning, but one would expect more professional scrutiny in the rarefied air of peer-reviewed psychology journals. Far from it. Even in the academic ether do respectable people, even those of the highest scientific standing, regularly rise to levels of speculation that can safely be called imprudent (see, for instance, Jamison, 1993). So what, then, is the link? Is there indeed just a thin line separating insanity from genius? The best place to start looking for an answer, one would think, is the scientific literature—if that is the right phrase to use here. I say this because one quickly discovers, while perusing this literature, that there does not seem to be any scientific data on the matter. The entire thesis of the highly-gifted mentally ill rests entirely on an unholy marriage of case reports and anecdotal storytelling (see for instance, Jamison, 1993 or Post, 1994). It is not uncommon, for instance, to read articles galloping through so many esoteric live episodes, irrelevant factoids, and so much delicious gossip (did you know that the reclusive William Cavendish insisted on having a chicken roasting at all hours of the day? ), that the validity of the link is all but a foregone conclusion. But it is one thing to be enchanted by folklore, it is quite another to turn a blind eye to lethal doses of selective data reporting. Like no other field of psychology, the study of creativity is beset with nebulous concepts, combustible propositions and myopic theorizing, to say nothing of all the vacuous fluff out there. The fog enshrouding this particular Potemkin village is nevertheless easy to lift. We need only to drill into some basic numbers on mental illness that continue to be enthusiastically ignored—incidence and prevalence data, to be precise—take the wraps off an astonishing medley of cognitive biases—base rate fallacy, availability heuristic, illusionary correlations and the like—and unpack a few question-begging definitions of creativity. As every undergraduate student knows, to establish a positive correlation between event A and some other event B, you need to collect baseline data on the frequency of both events. According to the (World Health Organization, 2013), mental illness, unlike genius, is by no means a rare phenomenon. Mood disorders, such as the various forms of bipolar and depressive disorders, occur in about 10% of the population. This amounts to hundreds of millions of people! Similar prevalence rates exist for anxiety disorders, which makes for a few more—wait for it—hundreds of millions of people! There is somewhat less suffering from schizophrenia, substance abuse disorder, the different kinds of personality disorders and autism, but enough to add several tens of millions more. The Centers for Disease Control and Prevention (2001) estimated in 2001—when the world's population stood at 6.2 billion, or about a billion less than today—that there were some 450,000,000 people living in poor mental health. The lifetime incidence of people making at least a single visit to the mind's Pre-Hell is said to be significantly over 50%. What do these staggering numbers mean? In the somber land of regression curves, they tell us that we can spare ourselves the trouble of determining the frequency of eminence in the population. For, irrespective of how we define creativity, let alone genius, this number must be less—vastly less. The simple truth of the matter is that the VAST majority of creative people are not mentally ill and, more importantly, the VAST majority of those suffering from psychopathology are not geniuses. Seen in this light, the claim that creativity and insanity somehow go together sounds more like densely ignorant nonsense, the stunted idea of someone who spent too many hours in a hot tub. It isn‘t my goal here to make a case for the opposite claim, but, by all evidence, it is hard to escape that conclusion. By the looks of these numbers, I would wager good money that the link between mental illness and genius is negative. To be exact: extremely negative. This isn’t to say that there might be something to it, perhaps if the data is parsed differently (see Simonton, in press), but this link, unqualified as in the BBC headline above, is wrong—outright! This would seems to hold not only for psychopathology tout court, but also for each psychological disorder alone, as well as, to restrict things further to severe cases of a given disorder or to specific types of creativity (Waddell, 1998). That this fact has been almost universally overlooked, like one would a tic, is as crazy as it is amazing. Most psychology undergraduate students, if they are reasonably attentive, would recognize the mad-genius howler as a textbook case of the base rate fallacy (Kahneman and Tversky, 1973). This common statistical sin, also known as base rate neglect, concerns the tendency to focus on specific information and ignore generic, baseline information, even when—and here is the rub—the latter is presented. Thus, people greatly underestimate the probability of a genius being totally sane and greatly overestimate the probability of an individual with mental illness being creative. The fact is that a very large proportion of creative people have no pathological symptoms (Simonton, 2005, in press). Incidentally, the same reference point neglect occurs for insanity and violence (Stuart, 2003). This link, too, is strongly negative, despite the perception we get from the media. But it doesn't end there. This error in thinking is so extensive and the opportunities for flummoxing so abundant that this matter is sure to continue to generate more heat than light. It is a disarming reflection of our reluctance, or inability, to think statistically that we just can't seem to snap, crackle, pop out of it. What makes our intuition misfire by such a wide margin? Seeing the world through our own warped force field is standard operating procedure of course. Psychologists have long accepted the sobering fact that our mind comes with a whole stack of cognitive biases preloaded and preinstalled. Without getting too technical about it, the one doing most of the dopamine squirting here bears the inauspiciously label “availability heuristic.” It is a mental shortcut that estimates the likelihood or frequency of an event by the ease with which a specific instance of it comes to mind. So when you think about the creativity-madness link, the odd behaviors of Michael Jackson are more likely to guide you than the 99% media-invisible normals. The availability heuristic as a cognitive mechanism was first proposed and demonstrated by Kahneman and Tversky (1973). In a now classic experiment, they asked people to judge the likelihoods of an English word either starting with the letter K or having a K as its third letter. With people more readily thinking of kitchen, kennel or kickboxing than ankle, Eskimo or acknowledge, their participants overestimated the number of words starting with a K and underestimated those with a K in third position. An English text, however, has about three times as many words with a third-place K; they are just not as available in memory. What's more, the availability heuristic also causes illusionary correlations, for the same reason. This leads to the perception of a non-existent relationship between two events simply because they occurred together at some point in the past (Chapman, 1967). Alternatively, this false impression can also arise from the way people incorrectly integrate contingency information (Perales and Shanks, 2007). Naturally enough, the more vivid the pairing, the more people tend to enduringly conflate the events and overestimate the frequency of their co-occurrence, and thus their causal relationship. The loopy logic then comes full circle with the confirmation bias, the tendency people have of confirming their existing beliefs. Cases that substantiate the belief, and ambiguous information that can be tweaked that way, strengthens the imaginary connection, while cases that violate or disconfirm it are ignored. Consider this rather typical finding from Redelmeier and Tversky (1996), who asked arthritis patients to track the weather over 15 months and judge to what extent their condition was related to it. While the correlation was actually zero, virtually all were certain that their level of pain depended on the weather. We have here a knockdown one-two punch then. The availability heuristic serves as the seed for the illusionary correlation between madness and genius, and the confirmation bias supplies the fertilizer that nourishes it. I could go on and on. In fact, I think I will. Pulling conceptual rabbits out of metaphysical thin air is routine business in creativity research. Open any source, academic or otherwise, and you will find the concept of creativity linked to, say, low arousal, defocused attention, right brains, unconscious processes, lateral thinking, or altered states of consciousness, to name but a few popular themes, when common sense alone tells you that their opposites are also sources of creative thinking (Dietrich, 2007). Consider, for instance, a study by Kyaga and colleagues (2011) that searched the database of Swedish registries for the insanely gifted, as it were. The real humdinger of the study was the operational definition of creativity. They found mental illness to be more common in people holding “creative occupations“—artists, writers, and scientists—compared to the evidently insipid army of accountants and auditors. Not only would this be news to engineers in Silicon Valley, but also the authors ask us to accept that writers and graphic designers are—by definitional fiat—creative. This is nuts. For the record, this study is the one that led to the BBC headline quoted earlier. All of this would seem to suggest that some serious scientific work needs to be done on the matter. In addition to controlling for cognitive biases, measurement and analytic issues can also contribute to a false assessment of the creativity-madness link (Simonton, in press). Until such time, I take my inspiration form the humanistic perspective and prefer to think, just like Abraham Maslow and Carl Rogers did, that creativity is associated with mental health. Standing tall at the top of the hierarchy of needs, creative imagination and expression is the hallmark of a well-adjusted, self-actualizing, fully functioning person. Centers for Disease Control and Prevention. (CDC). (2001). Available online at: http://www.cdc.gov/mentalhealth/basics/burden.htm. Jamison, K. R. (1993). Touched with Fire: Manic-Depressive Illness and the Artistic Temperament. New York, NY: Free Press. Koh, C. (2006). Reviewing the link between creativity and madness: a postmodern perspective. Educ. Res. Rev. 1, 213–221. Roberts, M. (2012). Creativity ‘closely entwined with mental illness’. Available online at: http://www.bbc.co.uk/news/health-19959565. 16 October 2012. Schlesinger, J. (2012). The Insanity Hoax: Exposing the Myth of the Mad Genius. New York, NY: Shrinktunes Media. Simonton, D. K. (2005). Are genius and madness related? Contemporary answers to an ancient question. Psychiatry Times 22, 7. Simonton, D. K. (in press). More method in the mad-genius controversy: A historiometric study of 204 historic creators. Psychol. Aesthet. Creativity Arts. Stuart, H. (2003). Violence and mental illness: an overview. World Psychiatry 2, 121–124. World Health Organization. (WHO) (2013). Available online at: http://www.who.int/mental_health/management/schizophrenia/en/. This is a nice (but short) discussion on progress being made in mapping the brain in order to understand neurological trauma. Trailblazers in neuroscience, Dr. Christof Koch and Dr. John Donoghue, reveal mind-blowing insights on how the brain turns thought into voluntary behaviors and how that knowledge is empowering victims of neurological trauma with regained physical abilities. John Donoghue is Henry Merritt Wriston Professor in the Department of Neuroscience at Brown University, Director of the Brown Institute for Brain Science, VA Senior Career Research Scientist, and Director of the Center of Excellence for Neurorestoration and Neurotechnology, Rehabilitation R&D Service, Department of Veterans Affairs Medical Center, Providence, RI. From 1991 to 2006, Dr. Donoghue was the founding Chairman of the Department of Neuroscience at Brown. For more than 20 years, Dr. Donoghue has conducted research on brain computer interfaces and his laboratory is internationally recognized as a leader in this field. Dr. Donoghue has published over 80 scientific articles in leading journals such as Nature and Science, and has served on advisory panels for the National Institutes of Health, the National Science Foundation and NASA. Dr. Donoghue has won awards for his work from Discover, Popular Mechanics, and Reader's Digest magazines. In 2007, he won the K. J. Zulch Prize, Germany's highest honor for neurological research. Dr. Donoghue is a fellow in the American Institute for Medical and Biomedical Engineering and the American Association for the Advancement of Science as well as a member of the board of directors for the MIT Media Lab. Dr. Donoghue received an A.B. from Boston University in 1971, an M.S. in anatomy from the University of Vermont in 1976, and a Ph.D. in neuroscience from Brown University in 1979. Christof Koch joined the Allen Institute as Chief Scientific Officer in 2011. For the past 25 years, Koch has served on the faculty at the California Institute of Technology (Caltech), from his initial appointment as Assistant Professor, Division of Biology and Division of Engineering and Applied Sciences in 1986, to his most recent position as Lois and Victor Troendle Professor of Cognitive & Behavioral Biology. Previously, he spent four years as a postdoctoral fellow in the Artificial Intelligence Laboratory and the Brain and Cognitive Sciences Department at the Massachusetts Institute of Technology. He received his baccalaureate from the Lycée Descartes in Rabat, Morocco, his M.S. in physics from the University of Tübingen in Germany and his Ph.D. from the Max-Planck-Institut für Biologische Kybernetik, Tübingen. Koch has published extensively, and his writings and interests integrate theoretical, computational and experimental neuroscience. Stemming in part from a long-standing collaboration with the late Nobel Laureate Francis Crick, Koch authored the book The Quest for Consciousness: A Neurobiological Approach. He has also authored the technical books Biophysics of Computation: Information Processing in Single Neurons and Methods in Neuronal Modeling: From Ions to Networks, and served as editor for several books on neural modeling and information processing. Koch's research addresses scientific questions using a widely multidisciplinary approach. His research interests include elucidating the biophysical mechanisms underlying neural computation, understanding the mechanisms and purpose of visual attention, and uncovering the neural basis of consciousness and the subjective mind. Koch maintains a part-time appointment and laboratory at Caltech. This is an older episode of LeveVei with Michel Bauwens of the P2P Foundation as the guest. I have been a tremendous fan of Bauwens' work for around ten years or so now. Below the introduction to the interview, I have included one of the essays linked to at the end of the post, a personal favorite of mine. In this episode I´m joined by Michel Bauwens, who is the founder of P2P-foundation which works to promote, research and develop different forms of peer to peer practices. He starts out by describing his engagement with civic entrepreneurship, where the P2P-foundation is one example of this kind of relational dynamic. He then explains in detail what peer to peer actually entails, while also placing this trend in a historical context in relation to how people have organized different forms of transaction and value creation. Another interesting point is how peer to peer can create a space for both cooperation and market-based competition. Further on in our conversation Bauwens describes how it´s possible to upscale the relational dynamics of peer to peer and apply it to larger societal change processes. He is currently engaged in a project in Ecuador and he uses this initiative as a case in point, explaining how Ecuador, through peer to peer practices, is trying to move into an open commons based knowledge society. 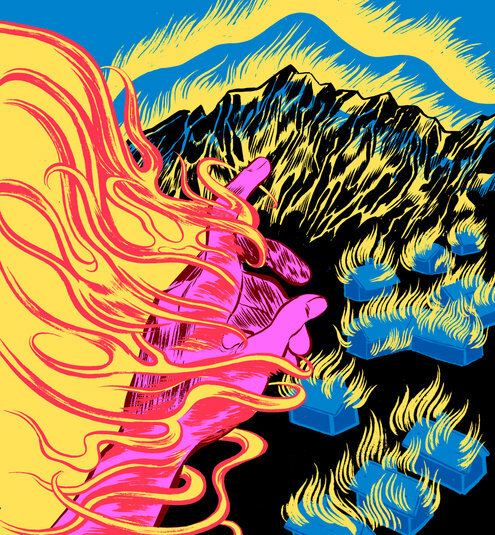 An interesting point here is how knowledge can be understood as an infinite resource, and with the advent of 3D-printing and local micro production facilities, this could have dramatic effects on how a society sustains itself. We also discuss how innovation often will come from the periphery, and not necessarily from the center stage, so maybe Ecuador can play an important role in global change processes? Another theme we bring up is how to understand peer to peer from an integral perspective, with reference to the work of for instance Ken Wilber and Susan Cook-Greuter. A poignent question here circles around if and how peer to peer presuppose higher stages of consciousness? Towards the last section of the interview Bauwens speaks to his hopes for the future development of peer to peer practice. Alexander Galloway in his book Protocol makes an important and clear distinction between centralized networks (with one central hub where everything must pass and be authorized, as in the old telephone switching systems), decentralized systems, with more than one center, but these subcenters still being authorative (such as the airport system in the U.S. centered around hubs where planes must pass through), from distributed systems, where hubs may exist, but are not obligatory (such as the internet). In distributed networks, participants may freely link with each other, they are fully autonomous agents. Hence the importance to clearly distinguish between our usage of the concepts 'decentralized' vs. 'distributed'. Peer to peer is specifically the relational dynamic that arises in distributed networks. So: what is peer to peer? Here’s a first tentative definition: It is a specific form of relational dynamic, is based on the assumed equipotency of its participants, organized through the free cooperation of equals in view of the performance of a common task, for the creation of a common good, with forms of decision-making and autonomy that are widely distributed throughout the network. This is of course a strong definition and statement, subject to a lot of refining and caveats. P2P processes are not structureless, but are characterized by dynamic and changing structures which adapt themselves to phase changes. It rules are not derived from an external authority, as in hierarchical systems, but generated from within. It does not deny ‘authority’, but only fixed forced hierarchy, and therefore accepts authority based on expertise, initiation of the project, etc… P2P may be the first true meritocracy. The threshold for participation is kept as low as possible. Equipotency means that there is no prior formal filtering for participation, but rather that it is the immediate practice of cooperation which determines the expertise and level of participation. Communication is not top-down and based on strictly defined reporting rules, but feedback is systemic, integrated in the protocol of the cooperative system. Techniques of 'participation capture' and other social accounting make automatic cooperation the default scheme of the project. Personal identity becomes partly generated by the contribution to the common project. As we will see, this is part and parcel of a widespread transformation to a mode of being which we call 'cooperative individualism'. P2P is not a return to earlier forms of community, but something new. P2P is a network, not a pyramidal hierarchy (though it may have elements of it); it is 'distributed', though it may have elements of hierarchy, centralization and 'decentralization'; intelligence is not located at any center, but everywhere within the system. Assumed equipotency means that P2P systems start from the premise that ‘it doesn’t know where the needed resource will be located’, it assumes that ‘everybody’ can cooperate, and does not use formal rules in advance to determine its participating members. Acceptance in P2P projects is not based on formal credentials, since it is no longer believed that skills can be reflected in such formal documents, and they are therefore 'anti-credentialist'. Equipotency, i.e. the capacity to cooperate, is verified in the process of cooperation itself. Such an equipotency is widely differentiated, as complex projects need a vastly differentiated skillset. Thus, competition is limited, and replaced by complementarity. This is also why authority is widely distributed and subject to change. Validation of knowledge, acceptance of processes, are determined by the collective. Cooperation must be free, not forced, and not based on neutrality (i.e. the buying of cooperation in a monetary system). It exists to produce something. It enables the widest possible participation. These are a number of characteristics that we can use to describe P2P systems ‘in general’, and in particular as it emerges in the human lifeworld. Whereas participants in hierarchical systems are subject to the panoptism of the select few who control the vast majority, in P2P systems, participants have access to holoptism, the ability for any participant to see the whole. Further on we will examine more in depth characteristics such as de-formalization, de-institutionalization, de-commodification, which are also at the heart of P2P processes. I have no doubt her new book will be equally as fascinating and astute in its observations. There have already been a ton of reviews, including the New York Times, Los Angeles Times, Slate, Seattle Times, The Independent, The New Republic (an interview, included below), NPR (another, much longer interview - best choice), Harper's (still another interview), and many, many more. "How," she asks, "do we reconcile the mystical experience with daily life? Let us be open to the anomalous experience. If you see something that looks like the Other, do not fall on your knees. Find out what it is and report back." Thank Darwin for an open-minded atheist. The following is a brief excerpt from her new book. MY atheism is hard-core, rooted in family tradition rather than adolescent rebellion. According to family legend, one of my 19th-century ancestors, a dirt-poor Irish-American woman in Montana, expressed her disgust with the church by vehemently refusing last rites when she lay dying in childbirth. From then on, we were atheists and rationalists, a stance I perpetuated by opting, initially, for a career in science. How else to understand the world except as the interaction of tiny bits of matter and mathematically predictable forces? There were no gods or spirits, just our own minds pressing up against the unknown. But something happened when I was 17 that shook my safely rationalist worldview and left me with a lifelong puzzle. Years later, I learned that this sort of event is usually called a mystical experience, and I can see in retrospect that the circumstances had been propitious: Thanks to a severely underfunded and poorly planned skiing trip, I was sleep-deprived and probably hypoglycemic that morning in 1959 when I stepped out alone, walked into the streets of Lone Pine, Calif., and saw the world — the mountains, the sky, the low scattered buildings — suddenly flame into life. There were no visions, no prophetic voices or visits by totemic animals, just this blazing everywhere. Something poured into me and I poured out into it. This was not the passive beatific merger with “the All,” as promised by the Eastern mystics. It was a furious encounter with a living substance that was coming at me through all things at once, too vast and violent to hold on to, too heartbreakingly beautiful to let go of. It seemed to me that whether you start as a twig or a gorgeous tapestry, you will be recruited into the flame and made indistinguishable from the rest of the blaze. I felt ecstatic and somehow completed, but also shattered. Of course I said nothing about this to anyone. Since I recognized no deities, and even the notion of an “altered state of consciousness” was unavailable at the time, I was left with only one explanation: I had had a mental breakdown, ultimately explainable as a matter of chemical imbalances, overloaded circuits or identifiable psychological forces. There had been some sort of brief equipment failure, that was all, and I determined to pull myself together and put it behind me, going on to finish my formal education as a cellular immunologist and become a responsible, productive citizen. It took an inexcusably long time for me to figure out that what had happened to me was part of a widespread category of human experience. Some surveys find that nearly half of Americans report having had a mystical experience. Historically, the range of people reporting such experiences is wide — including saints, shamans and Old Testament prophets as well as acknowledged nonbelievers like Virginia Woolf and the contemporary atheist writer Sam Harris. It is of course impossible to ascertain how much these experiences have in common. We may be comparing apples and asteroids. Of course all such experiences can be seen as symptoms of one sort or another, and that is the way psychiatry has traditionally disposed of the mystically adept: The shaman was simply the local schizophrenic, Saint Teresa of Avila a clear hysteric. The Delphic oracles may have been inhaling intoxicants; all of the great Christian mystics showed clear signs of temporal lobe epilepsy. A recent paper from Harvard Medical School proposes that the revelations experienced by Abraham, Moses, Jesus and Paul can all be attributed to “primary or mood-disorder-associated psychotic disorders.” I suspect we would have more reports of uncanny experiences from ordinary, rational people if it were not for the fear of being judged insane or at least unstable. An alternative to the insanity explanation would be that such experiences do represent some sort of encounter. It was my scientific training, oddly enough, that eventually nudged me to consider this possibility. Sometime in middle age, when I had become a writer and amateur historian, I decided that the insanity explanation may have been a cop-out, that I could have seen something that morning in Lone Pine. Barbara Ehrenreich is the author of Living With a Wild God and Nickel and Dimed: On (Not) Getting By in America. Here is the interview she did with The New Republic - the interview is most interesting as an example of how NOT to interview a smart person. Barbara Ehrenreich: I'm an Atheist, But Don't Rule Out "Mystical Experiences" A Q&A with the author of "Living With a Wild God"
Barbara Ehrenreich, the best-selling author of Nickel and Dimed: The (Futile) Pursuit of the American Dream, is generally known for reportage on subjects such as the minimum wage and the rights of workers. But this month she has released a new book that is less a change of pace than a step in an entirely different direction. 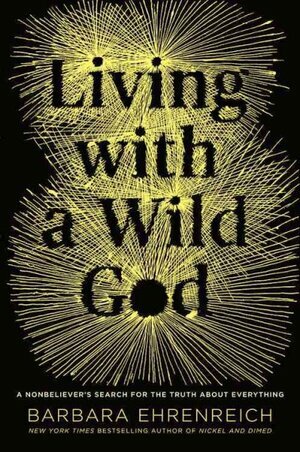 Living With a Wild God: A Nonbeliver’s Search for the Truth About Everything is Ehrenreich’s personal story of mystical experiences that she says first occurred when she was a girl. It is also a critique of science for failing to adequately investigate experiences like her own. The book has aroused controversy and discussion, in part because it comes from such an unexpected source. Ehrenreich and I recently spoke on the phone about her problems with monotheism, why she can’t read Christopher Hitchens, and why she still insists on calling herself an atheist. Isaac Chotiner: What are you arguing in this book? Barbara Ehrenreich: This book is not an argument. It is a report. IC: Tell us what you are reporting then. IC: Some things happen in the book that cause you to ask the questions differently. BE: Right. When I was 13, I had some particular mental adventures. Perceptual adventures. I began to see things rather differently. It seemed like a layer peeled off the world, layers that contained all the meanings and words and significance. Everything we apply to the world. I didn’t find it frightening. It was fascinating. Then when I was 17, I had an experience that I later learned could be called a “mystical experience.” It was almost violent. No faces, voices, nothing like that. It is like the world burst and flamed into life all around me. That is not a great image, but it is as good as I will ever do. IC: At that age, what was your explanation? IC: What caused the change? BE: I became a student of the history of religion. I am fascinated by how religions often center on mystical experience, and in the Old Testament tradition you find flames, the burning bush. I was beginning to find that other people had experienced such things. And furthermore I became convinced that historically our kind of monotheism is a kind of aberration. Multiple dieities, animal deities, but not good and benevolent deities. We now have a strange and limited vision. IC: Saying these experiences are real—that there are other spirits or consciousnesses out there—is very different from saying that maybe our brains just make us think that they are real? BE: What do you mean? Our brains visually perceive the world if we are not blind. The world is real. IC: So there is no difference between perceiving a spirit and perceiving a chair? I am confused. IC: Yes but we both agree the desk I am leaning on exists. That it is real. It may take a lot to perceive but it is there. BE: We are impelled to see the world as dead, without conscious agency. We are reductionists. We see the chair and know we can sit in it or lift it. But there are some things we experience that maybe do call for a different sort of explanation. And as a rational person with a scientific background I am putting that forward. And being called insane. IC: I am not calling you insane. I still don’t know whether you think they are real or whether they are products of our brain. Those seem like hugely different claims and ideas and even subjects. BE: As I say in the last paragraph of my book, it is all in my head. And yes, of course, it is. IC: But it is not all in your head if there are other conscious beings floating about. BE: Well, that’s what I would like to know. Here is one example. In the 19th century, most physicians would have said that contagious diseases were caused by mist in the air. If you had said, no, there are living things, you would have sounded insane because those things were invisible. There is a lesson in that. There may be invisible things that are still there. IC: Well, there is no end to the number of things that might be there. IC: When you say “wired,” do you mean designed, like with intelligent design, or just some evolutionary reason? BE: I wouldn’t even speculate. I have no theory of why natural selection would favor these sorts of experiences. BE: Absolutely no! We know in our ordinary lives that our pets are conscious beings with feelings. But the doctrine was still Cartesian. These are little mechanisms or things. We are alone. That has been central to science, the denial of agency except in the case of humans and some hypothetical diety. IC: Are you critiquing science or just saying science needs to get better? We know all this stuff because of science. BE: I remain a scientific rationalist. I want science to look at these odder phenomena, and not rule out the possibility of mystical experiences with another kind of mind. IC: Are scientists ruling it out, or saying these are not evidence for it? BE: We need databases. William James kept one. But it is unexamined, the data that might be there. People are so afraid to talk about it. My book has gotten readers, and I have gotten friends to tell me that similar things happened but they were scared to talk about it. This is going to sound totally crazy to you but this is a public health issue! When people have a shattering type of experience and never say anything about it, it is time to investigate. IC: The last five or ten years have seen the rise of what’s called the ‘New Atheism.’ How do you think about this, and about the use of the word atheism? BE: I am an atheist. As for the ‘New Atheists,’ I am not that interested because I was raised on this. I couldn’t, delightful as he is, read Hitchens’s book. He sounded too much like my dad. I have heard it all. That is a tiny American working class tradition. Skepticism, free thought, atheism. IC: It’s interesting that you call yourself an atheist rather than an agnostic. BE: I am insistent on atheist. If we are talking about a monotheistic, benevolent God, I know there is no such thing. IC: How do you know that there is no benevolent God when you think there might be spirits talking to me? BE: It depends on what I have experienced. I have many areas of experience which show there is no giant benevolent force. IC: But some people claim to experience a monotheistic God. BE: That is not my experience. IC: But we don’t make these grand judgments based on our own experience. [Pause] Do we? BE: To an extent. Where is the evidence for a benevolent God? IC: I agree with you. But there isn’t evidence for spiritual figures in the room either. BE: Well, we need to find out. In the central nervous system (CNS), one of the key neurotransmitter systems involved in the response to stress and in the development of neuropsychiatric disorders is the 5-hydroxytriptamine (5-HT) system (Kirby et al., 1995; Graeff et al., 1996; Cryan et al., 2005; Savitz et al., 2009; O’Leary and Cryan, 2010). The majority of 5-HT neurons are located in the dorsal and median raphé nucleus in the brainstem (Graeff et al., 1996; Michelsen et al., 2007). Projections from these neurons innervate several structures of the limbic system, including the amygdala and hippocampus, and it has been described that through these projections the 5-HT system regulates the fight or flight reaction to stress (Graeff et al., 1996; Michelsen et al., 2007), by a region-specific release of 5-HT (Kreiss and Lucki, 1994; Kirby et al., 1995; Graeff et al., 1996). Densitometric analysis revealed that maternal separation (MS) increased 5-HT1A receptor mRNA expression in the amygdala, and reduced its expression in the dorsal raphé nucleus (DRN), but no changes were observed in the hippocampus in comparison to non-separated (NS) controls. Also, MS reduced SERT mRNA expression in the DRN when compared to NS rats. These results suggest that early-life stress induces persistent changes in 5-HT1A receptor and SERT mRNA expression in key brain regions involved in the development of stress-related psychiatric disorders. All of this suggests that early stress causes an increase the serotonergic receptors in the amygdala, the fear processing center of the brain, and that the 5-HT system is instrumental in the fight or flight reaction to stress. The same stress responses play a powerful role in mental illnesses as well. It's notable that one of the ACE questions involves emotional neglect. A subset of this group is the children of narcissists - Daniel Shaw has written the definitive book on that topic, Traumatic Narcissism: Relational Systems of Subjugation (2014). Early-life experience plays a major role in the stress response throughout life. Neonatal maternal separation (MS) is an animal model of depression with an altered serotonergic response. We hypothesize that this alteration may be caused by differences in 5-HT1A receptor and serotonin transporter (SERT) mRNA expression in brain areas involved in the control of emotions, memory, and fear as well as in regions controlling the central serotonergic tone. To test this, Sprague–Dawley rats were subjected to MS for 3 h daily during postnatal days 2–12. As control, age matched rats were non-separated (NS) from their dams. When animals reached adulthood (11–13 weeks) brain was extracted and mRNA expression of 5-HT1A receptor in amygdala, hippocampus and dorsal raphé nucleus (DRN) and SERT in the DRN was analyzed through in situ hybridisation. Densitometric analysis revealed that MS increased 5-HT1A receptor mRNA expression in the amygdala, and reduced its expression in the DRN, but no changes were observed in the hippocampus in comparison to NS controls. Also, MS reduced SERT mRNA expression in the DRN when compared to NS rats. These results suggest that early-life stress induces persistent changes in 5-HT1A receptor and SERT mRNA expression in key brain regions involved in the development of stress-related psychiatric disorders. The reduction in SERT mRNA indicates an alteration that is in line with clinical findings such as polymorphic variants in individuals with higher risk of depression. These data may help to understand how early-life stress contributes to the development of mood disorders in adulthood. In the early postnatal period of the rat, the brain is thought to be a developmental equivalent to the last trimester in utero and the perinatal period of human brain development (Romijn et al., 1991; Watson et al., 2006; Goodfellow et al., 2009), thus allowing for the use of postnatal rodent models in the investigation of the early programing of stress-related psychiatric disorders. It has been proposed that stress during developmental stages, can lead to developmental alterations that become evident in adult life (Barker, 1995), and moreover, during early-life the psychosocial milieu can substantially alter the nervous system, through mechanisms that permanently affect gene expression (Mathews and Janusek, 2011). There are 14 types of 5-HT receptors, divided into seven families, with different subtypes identified by letters (A–F in the case of 5-HT1 receptors; Hoyer et al., 1994; Barnes and Sharp, 1999; Bockaert et al., 2010). One of these receptors is 5-HT1A, a G protein-coupled receptor that has been described to play an important role in the development of psychiatric disorders (Bowen et al., 1989; López et al., 1998; Drevets et al., 1999; Gross et al., 2002; Savitz et al., 2009). The 5-HT1A receptor is predominantly a somatodendritic autoreceptor in the neurons of the raphé nucleus regulating the amount of 5-HT released and therefore serotonergic activity in the different projection areas (Blier and de Montigny, 1987; Hutson et al., 1989; Hjorth and Sharp, 1991; Kreiss and Lucki, 1994; Savitz et al., 2009). Also, 5-HT1A receptor expression has been described in forebrain areas (Chalmers and Watson, 1991; Pompeiano et al., 1992; Cryan et al., 2005; Savitz et al., 2009) including the hippocampus and amygdala, structures involved in learning, control of emotions, memory and fear related information (Vizi and Kiss, 1998; Nestler et al., 2002; LeDoux, 2007). Alterations in 5-HT1A receptor function have been related to mood disorders, as imaging analysis shows that depressive patients have reduced 5-HT1A receptor binding (Drevets et al., 1999; Sargent et al., 2000) as well as blunted responses to 5-HT1A receptor agonists (Lesch et al., 1990a,b). Another component of the 5-HT system is the serotonin transporter (SERT), a presynaptic protein involved in the termination of the serotonergic signal through the reuptake of 5-HT from the synapse (Blakely et al., 2005). In the pharmacological treatment of depression, selective serotonin reuptake inhibitors (SSRIs) have been widely used (Frazer, 1997). SSRIs can readily inhibit SERT activity and elevate the serotonergic tone in the brain. However, full therapeutic effects become apparent only after chronic SSRI use, suggesting that alterations in this transporter are highly relevant to the development and treatment of psychiatric disorders (Frazer and Benmansour, 2002). Neonatal maternal separation (MS) is a well validated animal model of depression and increases anxiety resulting in behavioral alterations (Lippmann et al., 2007) and functional changes in the hypothalamus-pituitary-adrenal (HPA) axis responsiveness in adulthood (Ladd et al., 1996; Schmidt et al., 2004; O’Mahony et al., 2009). In addition, MS animals have been reported to display alterations in their central corticotrophin releasing factor (CRF) system (Bravo et al., 2010; O’Malley et al., 2011), which is suggestive of an altered gene expression in key brain areas as result of early-life stress. There is evidence suggesting an enhanced serotonergic response in animals subjected to MS, as there are differences in brain stem levels of 5-HT and its metabolite 5-hydroxyindole acetic acid (5-HIAA; O’Mahony et al., 2008), as well as increased responsiveness to the SSRI citalopram (Arborelius et al., 2004).Therefore, differences in central serotonergic modulation in adult rats subjected to early-life stress could arise as a result of altered 5-HT1A receptor and SERT expression in areas of the brain involved in the control of emotions, memory, and fear as well as in areas controlling the central serotonergic tone. To test this, in situ hybridization was used to study topographical differences in 5-HT1A receptor and SERT mRNA expression in the hippocampus, amygdala, and dorsal raphé nucleus (DRN) between MS and non-separated (NS) rats. Adult male Sprague–Dawley (SD) rats that underwent a MS protocol were used (n = 6 MS from three different litters and n = 6 NS controls from three different litters). All animals were housed in standard conditions (room temperature of 21°C, with a 12 h light dark cycle) with access to regular chow and water ad libitum. Cages were cleaned once weekly to avoid excessive handling. Rats were of comparable weight (276–410 g) and age (11–13 weeks) at the moment of sacrifice All experimental procedures were carried out in accordance with the protocols approved by the Ethics Committee, at University College Cork, Cork, Ireland under a license issued from the Department of Health and Children (Cruelty to Animal Act 1876, Directive for the Protection of Vertebrate Animals used for Experimental and other Scientific Purposes [89/609/EEC]). Early-life stress procedure (Hyland et al., 2009; O’Mahony et al., 2009, 2010) was adapted from a previously described protocol (Wigger and Neumann, 1999). Briefly, the litters that were randomly assigned to undergo MS, were removed from the home cage and placed into a smaller cage on heating pads set at 30–33°C for 3 h (9.00–12.00 h). After that time, pups were returned to the original home cage in the main colony room. This procedure was repeated from postnatal day 2 (P2) to P12. Control, NS litters remained undisturbed except for routine cage cleaning performed once a week. At P21, pups were weaned and group-housed (3–5 per cage), and left undisturbed until adulthood (11–13 weeks). We have previously shown that this MS protocol induces an array of behavioral and physiological changes that are indicative of increased anxiety and altered HPA axis function (O’Mahony et al., 2009). Animals were lightly anesthetized with isoflurane, and killed by decapitation. The brain was immediately extracted and snap frozen in isopentane kept cold with dry ice. The brains were stored at -80°C before being processed for in situ hybridisation. The in situ hybridisation was carried out with oligodeoxynucleotide (cDNA) probes complementary to 5-HT1A receptor mRNA (2107–2151 pb access number AF217200)and SERT mRNA (1719–1763 pb access number Y11024.1), labeled with a digoxigenin (DIG) oligonucleotide 3′-OH tailing kit (Roche, Molecular Biochemicals, Mannheim, Germany). The hybridisation was conducted as previously described (Bravo et al., 2009, 2010). Briefly, coronal brain sections of 10 μm thick were obtained from frozen brains and mounted on superfrost-plus glass slides (Menzel-Glaser, Menxel GmbH & Co., Germany). For hippocampus, four to five non-consecutive slices separated at least 100 μm from each other, approximately from bregma -2.56 mm to bregma -3.6 mm were analyzed bilaterally. For the amygdala: bilateral analysis of four to five slices of tissue, separated at least 100 μm from each other, approximately from bregma -1.80 mm to bregma -2.80 mm. In the case of the DRN at least three slices separated as a minimum as 100 μm from each other, approximately from bregma -7.64 mm to bregma -8.00 mm were obtained. These sections were post-fixed in 4% paraformaldehyde made in PBS for 30 min. Then the slides were permeabilized with proteinase K (0.5 mg/100 mL in TE buffer) and treated with acetic anhydride buffer. Next, the slides underwent dehydration through a series of ethanol dilutions (70, 95, and 100%) before being delipidated in chloroform for 5 min. The tissues were then rehydrated and placed in a humidity chamber with the hybridisation solution [formamide 50%, saline sodium citrate (SSC) buffer 4x, sheared salmon DNA 6.25 mg/mL, tRNA 125 μg/mL, and cDNA probe at fixed concentration of 100 pmol/mL for each probe] and incubated overnight at 37°C. After that, the sections were washed in ascending dilutions of SSC buffer (4, 2, 1, and 0.5x), and then equilibrated with maleic acid 0.1 M buffer before blocking for unspecific protein binding with Roche’s blocking reagent (Roche, Molecular Biochemicals, Mannheim, Germany). After 30 min of blocking, the DIG molecules attached to the hybridized probes were detected with an anti DIG antibody, conjugated with an alkaline phosphatase (Roche, Molecular Biochemicals, Mannheim, Germany). Finally, a substrate for the alkaline phosphatase (NBT/BCIP; Sigma, St. Louis, MO, USA) was added, and when a violet/blue precipitate was present on the tissues, the reaction was stopped. The slides were then left to air dry and cover-slips were mounted with DPX mounting media (Fisher Scientific, Loughborough, UK). Once the mounting media was dry, pictures of the areas of interest were taken with an Olympus DP71 digital camera attached to an Olympus BX51 microscope (Olympus Corporation, Tokyo, Japan). Specificity of the hybridisation was evaluated by the use of 100-fold excess of the unlabelled oligodeoxynucleotide. For semiquantitative analysis, densitometric measurements of each hippocampal, amygdala, and DRN were analyzed using FujiFilm’s Science Lab Multi Gauge v2.2 software (Fuji Photo Film Co., Ltd). All pictures were analyzed in gray scale and the value given by the software corresponds to the intensity of pixels (the darkest staining is the highest intensity; and the lightest staining the lowest intensity) in a given area (density of pixels). In the hippocampus, the hybridisation signal in the stratum radiatum was considered as background and was subtracted from the pixel density values obtained in the hippocampal cell layers. As for the amygdala, a small region between the analyzed areas was considered as background, and for the DRN a small region surrounding this structure was taken as background. For each animal the value represents the average from 4–5 non-consecutive brain sections (analyzed on both brain hemispheres for hippocampus and amygdala). All the values are expressed as the mean ± SEM. Data were analyzed with a two tailed Student’s t-test using GraphPad Prism 4 (GraphPad Software Inc., La Jolla, CA, USA). Statistical significance was accepted at the level p < 0.05. Signal for 5-HT1A receptor mRNA was detected in the amygdala (Figures 1D,E), DRN (Figures 2B,C), and hippocampus (Figures 3E,F), and for SERT mRNA in the DRN (Figures 4B,C). The level of staining in each case allowed densitometric analysis. Negative controls were performed using an excess of unlabelled cDNA probe during the hybridisation stage (not shown). FIGURE 1. 5-HT1A receptor mRNA expression in the amygdala. Maternal separation (MS) increases 5-HT1A receptor mRNA expression in three different areas of the amygdala in comparison to non-separated (NS) animals. Graphical representations of the densitometric analysis in the basomedial amygdala (BMA; ***p < 0.001; A), basolateral amygdala (BLA; **p < 0.01; B), and central amygdala (CeA; *p < 0.05; C). Representative microphotographs of 5-HT1A receptor mRNA expression in NS (D) and MS (E) animals (scale bar represents 1 mm; NS, n = 6 and MS, n = 6). FIGURE 2. 5-HT1A receptor mRNA expression in the DRN. Maternal separation (MS) reduces 5-HT1A receptor mRNA expression in the DRN in comparison to NS animals. Graphical representations of the densitometric analysis in the DRN (**p<0.01; A). Representative microphotographs of 5-HT1A receptor mRNA expression in NS (B) and MS (C) animals (scale bar represents 500 μm; NS, n = 6 and MS, n = 6). FIGURE 3. Hippocampal expression of 5-HT1A receptor mRNA. 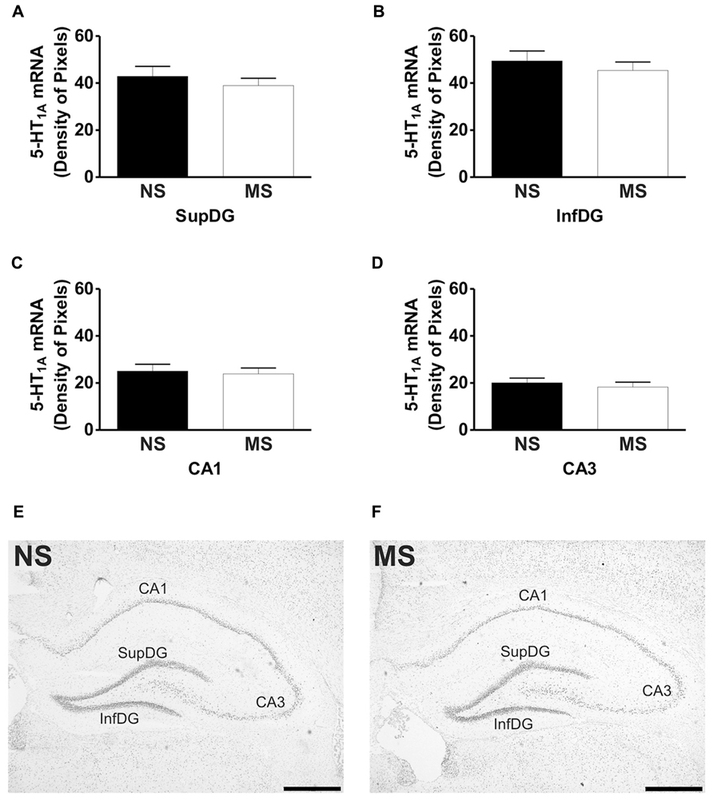 Maternal separation (MS) did not affect 5-HT1A receptor mRNA expression in the hippocampus when compared to NS animals. Graphical representations of the densitometric analysis in the suprapyramidal layer of the dentate gyrus (SupDG; A), infrapyramidal layer of the dentate gyrus (InfDG; B), cornus ammon field 1 (CA1; C) and cornus ammon field 3 (CA3; D). Representative microphotographs of 5-HT1A receptor mRNA expression in NS (E) and MS (F) animals (scale bar represents 1 mm; NS, n = 6 and MS, n = 6). FIGURE 4. SERT mRNA expression in the DRN. Maternal separation (MS) reduces SERT mRNA expression in the DRN in comparison to NS animals. Graphical representations of the densitometric analysis in the DRN (**p < 0.01; A). Representative microphotographs of SERT mRNA expression in NS (B) and MS (C) animals (scale bar represents 500 μm; NS, n = 6 and MS, n = 6). Early-life stress significantly increased the levels of 5-HT1A receptor mRNA in the basomedial amygdala (BMA; Figure 1A; NS vs. MS: 10.39 ± 0.49 vs. 13.58 ± 0.36; t(10) = 5.226, p < 0.001), basolateral amygdala (BLA; Figure 1B; NS vs. MS: 4.27 ± 0.18 vs. 5.55 ± 0.33; t(10) = 3.373, p < 0.01) and central amygdala (CeA; Figure 1C; NS vs. MS: 3.35 ± 0.14 vs. 4.86 ± 0.51; t(10) = 2.838, p < 0.05), and decreased the expression of this transcript in the DRN (Figure 2A; NS vs. MS: 25.85 ± 1.49 vs. 18.87 ± 1.1; t(10) = 3.804, p < 0.01) when compared to NS controls. However, densitometric analysis of the 5-HT1A receptor transcript revealed no differences between MS and NS animals in any of the hippocampal layers (Figure 3). Maternal separation induced a significant reduction to the transcript for SERT in the DRN in comparison to NS rats (Figure 4A; NS vs. MS: 7.58 ± 0.43 vs. 5.38 ± 0.37; t(10) = 3.840, p < 0.01). The present data shows that early-life stress affects gene expression in adulthood, contributing to inadequate stress responses and could therefore lead to the manifestation of stress-related psychiatric disorders. Similar alterations have been described for another neurotransmitter system (Bravo et al., 2010), which further suggest that early-life stress does affects CNS function. Although MS did not affect 5-HT1A receptor mRNA expression in the hippocampus, a structure involved in memory and learning (Jacobson and Sapolsky, 1991; Vizi and Kiss, 1998), it increased its expression in three subregions of the amygdala, a structure related to the control of emotions and fear (LeDoux, 2007). In addition, MS reduced 5-HT1A receptor mRNA expression in the DRN, the major source of serotonergic input to the forebrain which is involved in the control of the central serotonergic tone (Graeff et al., 1996). Also, early-life stress reduced the expression of SERT mRNA in the DRN, which could have an impact on the bioavailability of 5-HT in projection areas of the DRN. These alterations suggest that the behavioral, physiological and molecular deficits described for this animal model (Ladd et al., 1996; Schmidt et al., 2004; Lippmann et al., 2007; O’Mahony et al., 2009) could arise as a consequence of changes in gene expression in key brain regions involved in the development of stress-related psychiatric disorders. Early-life stress, such as that induced by MS, physical, sexual and emotional abuse and general neglect during childhood, has been associated with serious psychiatric impairments in adulthood (MacMillan et al., 2001; Lupien et al., 2009). During postnatal development the brain undergoes a variety of adaptive changes that depend mostly on the type of stimuli being received (Schmidt et al., 2004). In rats there is a period of reduced stress responsiveness during the first 2 weeks of life (Sapolsky and Meaney, 1986) which can be disinhibited by prolonged MS (Schmidt et al., 2004; O’Mahony et al., 2009). These long periods of MS immediately impact brain gene expression, including the 5-HT1A receptor. For example, Goodfellow et al. (2009) show that 5-HT1A electrophysiological activity in the prefrontal cortex is enhanced in the first 2 to 3 postnatal weeks after MS (3 h a day from P2 to P14). Moreover, mRNA expression of the 5-HT1A receptor in maternally separated animals is increased at postnatal day 9 (Goodfellow et al., 2009). However, when these animals reach adulthood (≥P40), the electrophysiological effects mediated by the 5-HT1A receptor are not different between maternally separated rats and their respective controls, and there is no difference in mRNA expression between rats subjected to early-life stress and control animals (Goodfellow et al., 2009). Nevertheless, exposure to social isolation stress reduces the 5-HT1A-elicited electrophysiological activity in the prefrontal cortex of animals that were exposed to early-life stress, in comparison to control rats (Goodfellow et al., 2009), thus suggesting that early-life stress increases the susceptibility toward stress-related psychiatric disorders in adulthood. We have previously described alterations in serotonin metabolism in MS rats (O’Mahony et al., 2008), and additionally, alterations in the central serotonergic system have also been described as a result of different MS procedures (Arborelius and Eklund, 2007; Oreland et al., 2009). Oreland et al. (2009) have shown that brief exposures to MS (15 min from P1 to P13) reduces brain stem expression of 5-HT1A receptor mRNA (Oreland et al., 2009), a procedure that can also affect other neurotransmitter systems (Jaworski et al., 2005; Plotsky et al., 2005). This type of MS could be considered a more naturalistic stress as it mimics the natural rearing environment of rats, where the mother leaves her pups for short periods to forage (Arborelius et al., 2004; Arborelius and Eklund, 2007; Oreland et al., 2009). On the other hand, there is also evidence demonstrating that brief and long daily periods of MS do not affect 5-HT1A receptor and SERT mRNA expression (Arborelius et al., 2004), and furthermore, it has been shown that long periods of daily MS are more effective in producing changes in behavior and alterations in biomarkers associated to stress-related psychiatric disorders (Lippmann et al., 2007; O’Mahony et al., 2009; Bravo et al., 2010). Our previous studies demonstrated that a protocol consisting of 3 h of MS from P2 to P12 produces an increase in corticosterone levels (O’Mahony et al., 2009) and an increase in serotonin turnover (O’Mahony et al., 2008). However, quantitative real time PCR (qRT-PCR) revealed no differences in the expression of 5-HT1A receptor and SERT transcripts in complete brainstem homogenates of MS animals in comparison to NS rats (O’Mahony et al., 2008). Whilst qRT-PCR is a sensitive technique used to assess gene expression, is also a crude method which dilutes any localized changes in gene expression that might occur as a result of early-life stress. Therefore, the present findings corroborate that alterations in serotonin metabolism, induced by MS (O’Mahony et al., 2008), can be consequence of changes in gene expression within the DRN. However, it is important to note that the present observations only represent changes at the mRNA level and not protein, and they could be just a reflection of a more complex situation involving other neurotransmitter systems (Bravo et al., 2010) and a variety of intracellular cascades that can affect the expression of these transcripts in the different studied areas. Maternal separation affected the expression of 5-HT1A receptor mRNA in the amygdala. The transcript for this receptor has been described in the rat BMA (Chalmers and Watson, 1991; Pompeiano et al., 1992), and binding of radio labeled 5-HT1A receptor antagonists has been shown in the BLA and CeA (Vicentic et al., 2006). In the present study, early-life stress increased the levels of the transcript for 5-HT1A receptor in the BMA, and also in the BLA and CeA, although in these areas the level of transcript was much lower than in the BMA. It has been shown that activation of 5-HT1A receptors within the amygdala using the agonist 8–Hydroxy-2-(dipropylamino)tetralin (8-OH-DPAT) reduces the levels of social interaction of male rats (Gonzalez et al., 1996), demonstrating that 5-HT1A activation in the amygdala of rats mediates anxiogenic effects. Moreover, and in line with the present findings, Vicentic et al. (2006) showed that non-handled rats (similar to our NS condition) have lower binding capacity of the 5-HT1A receptor antagonist 4-(2′-methoxyphenyl)-1-[2′-[N-(2′′-pyridinyl)-p-iodobenzamido] ethylpiperazine (pMPPI) in the BMA and BLA in comparison to MS animals. Therefore, the increase in 5-HT1A receptor mRNA expression within the amygdala of MS rats could account for some of the behavioral changes observed by Lippmann et al. (2007), where MS reduced locomotor activity, increased acoustic startle and also affects HPA axis responsiveness in adulthood (Ladd et al., 2005; Lippmann et al., 2007; O’Mahony et al., 2009). In contrast to the increased expression of 5-HT1A receptor mRNA in the amygdala, there were lower levels of 5-HT1A receptor mRNA found in the DRN of MS rats in comparison to their controls. In this structure there is a high density of 5-HT1A receptors (Blier and de Montigny, 1987; Hutson et al., 1989; Hjorth and Sharp, 1991; Kreiss and Lucki, 1994; Cryan et al., 2005; Savitz et al., 2009), and activation of these presynaptically located receptors decreases the firing frequency, 5-HT synthesis and release from these neurons (Blier and de Montigny, 1987; Sprouse and Aghajanian, 1987; Hjorth and Magnusson, 1988; Hutson et al., 1989; Sharp et al., 1989; Kreiss and Lucki, 1994; Cryan et al., 2005). In addition, 5-HT1A receptor activation in the DRN has been shown to produce anxiolytic effects in different animal models (Andrews et al., 1994; Hogg and File, 1994; Jolas et al., 1995; Picazo et al., 1995; File et al., 1996; Remy et al., 1996; Romaniuk et al., 2001; Koprowska et al., 2002). The reduced levels of 5-HT1A receptor mRNA in the DRN of MS rats suggests an impaired regulation of the central serotonergic tone that could translate into inadequate behaviors toward stressful situations such as those observed by Lippmann et al. (2007). Moreover, we have previously shown that MS rats have altered 5-HT and 5-HIAA levels in the brain stem that clearly suggests an increased turnover of this neurotransmitter (O’Mahony et al., 2008). This could be a consequence of the lower 5-HT1A receptor expression in the DRN, as a lower level of this receptor could impact on the frequency of discharge and/or synthesis and release of 5-HT and therefore affect the neurotransmitter’s metabolism. In line with the previous suggestion, Ase et al. (2000) showed that 5-HT1A receptor knock-out mice have increased 5-HT turnover. However, these animals show no differences in basal levels of 5-HT in forebrain areas (Ase et al., 2000; He et al., 2001; Knobelman et al., 2001) and in the DRN (Ase et al., 2000; Bortolozzi et al., 2004) in comparison to wild-type controls. These observations argue against a role of presynaptic 5-HT1A receptors in the maintenance of the central serotonergic tone, and therefore reveal the complexity of 5-HT neurotransmission regulation. Another level of regulation to the central 5-HT neurotransmission involves SERT. The levels of SERT mRNA were lower in the DRN of MS rats in comparison to NS rats, which suggest that the reuptake of the neurotransmitter could be affected. The importance of this finding is that changes in SERT expression have been related to psychiatric disorders. For instance, during treatment with SSRIs, the most widely prescribed antidepressants (Frazer, 1997), SERT gets downregulated, which seems to correlate with the efficacy of the treatment (Benmansour et al., 1999, 2002; Frazer and Benmansour, 2002; Gould et al., 2003; Thakker et al., 2004, 2005). However, SERT deficient mice display anxiety- and depression-like behaviors (Holmes et al., 2002; Lira et al., 2003), which suggest that the absence of this gene from early developmental stages affects the ability to cope with stressful situations throughout life. In addition, animals treated during early development with SSRIs also display altered behaviors in adulthood (Mirmiran et al., 1981; Vogel et al., 1990), as the antidepressant would down regulate SERT in early-life. Moreover, downregulation of SERT in adult animals resembles the effects of antidepressant treatment (Thakker et al., 2004, 2005), further highlighting an important role of SERT in the development of the serotonergic system during early-life. In the present study, the reduction in SERT mRNA expression in the DRN not only could affect local serotonin levels (and perhaps its turnover), but it could also impact the adequate development of the serotonergic system and therefore affect the ability to cope with stress. In addition, the reduction in SERT mRNA indicates an alteration that is in line with clinical findings. Individuals with a short allele for SERT, that reduce the efficiency of the gene’s transcription, showed more depressive symptoms in relation to stressful events than individuals with the long version of the allele (Caspi et al., 2003), and therefore are at a higher risk of developing psychiatric disorders such as depression. In summary, the present findings, along with previous observations on other neuronal systems (Bravo et al., 2010) strongly suggest that early-life stress permanently affects gene expression in the CNS. These changes in 5-HT1A receptor and SERT mRNA reflect alterations in a neurotransmitter system that has been extensively related to the development of mood disorders. Moreover, these changes were observed in key brain areas related to the behavioral response to stress. Therefore, these data helps to understand how early-life stress contributes to the development of mood disorders later in life. Javier A. Bravo, Timothy G. Dinan and John F. Cryan designed research; Javier A. Bravo performed research and acquired data; Javier A. Bravo, Timothy G. Dinan and John F. Cryan interpreted and analyzed data; and Javier A. Bravo, Timothy G. Dinan and John F. Cryan drafted, revised and wrote the paper. We would like to thank Drs. Gerard Clarke, Marcela Julio-Pieper, and Mr. Patrick Fitzgerald for their technical assistance. Javier A. Bravo is supported by a grant from the Vicerrectoría de Investigación y Estudios Avanzados from the Pontificia Universidad Católica de Valparaíso (Grant No. 037.499/2013). John F. Cryan and Timothy G. Dinan are supported in part by Science Foundation Ireland in the form of a Centre Grant (Alimentary Pharmabiotic Centre). The centre is also funded by GlaxoSmithKline. 3. Did an adult or person at least 5 years older than you ever… Touch or fondle you or have you touch their body in a sexual way? 4. Did you often or very often feel that …No one in your family loved you or thought you were important or special? 5. Did you often or very often feel that …You didn’t have enough to eat, had to wear dirty clothes, and had no one to protect you? 7. Was your parent or caretaker often or very often... pushed, grabbed, slapped, or had something thrown at them? 63% of the people who participated in the study had experienced at least one category of childhood trauma. 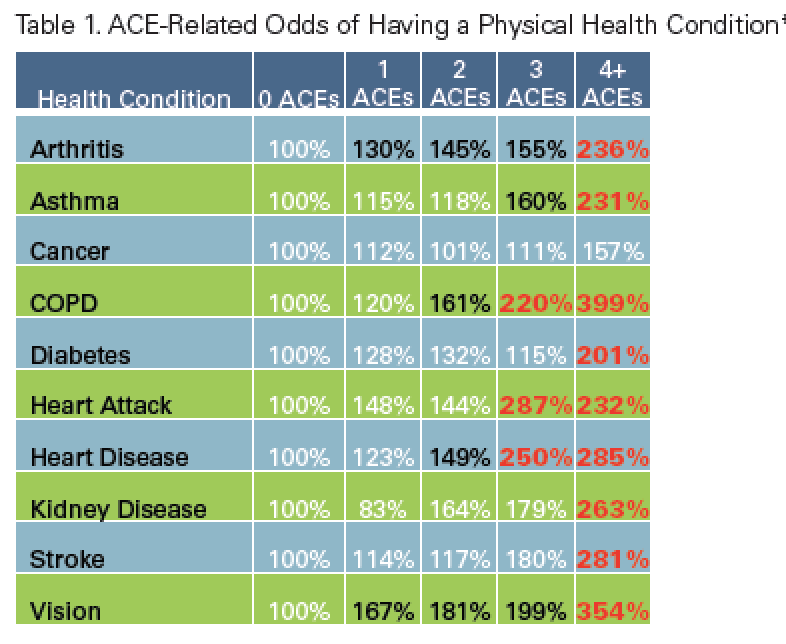 Over 20% experienced 3 or more categories of trauma which we call Adverse Childhood Experiences (ACEs). • 11% experienced emotional abuse. • 28% experienced physical abuse. • 21% experienced sexual abuse. • 15% experienced emotional neglect. • 10% experienced physical neglect. • 13% witnessed their mothers being treated violently. • 27% grew up with someone in the household using alcohol and/or drugs. • 19% grew up with a mentally-ill person in the household. • 23% lost a parent due to separation or divorce. • 5% grew up with a household member in jail or prison. Juliana Breines - Why Do We Blame Victims?